Professor Basil Sharp (centre back), Chair in Energy Economics and Director, with Dinah Towle, Coordinator, Dr Selena Sheng, Research Fellow, Dr Erwann Sbai, Senior Lecturer, Economics, and Milad Maralani (front), Doctoral Candidate, Energy Centre, Faculty of Business and Economics. New Zealand has a wonderful opportunity to lead the world in developing sustainable energy. We aim to underpin this with research, teaching and community outreach. The Energy Centre is a vital bridge between industry, government and the community. 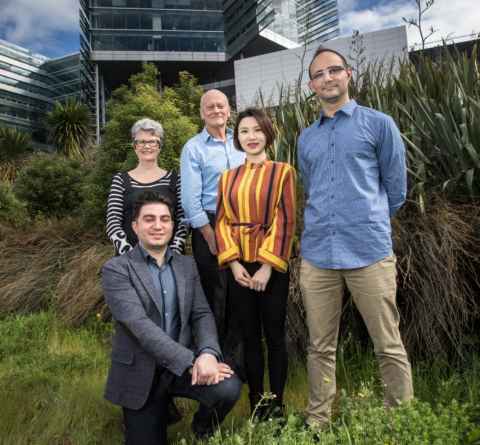 Our researchers independently analyse New Zealand’s key energy challenges, drawing on expertise in economics, engineering and physical, biological and social sciences. We collaborate with business in our annual Summer School in Economics and cross-faculty teams are tackling energy challenges based on real world issues. Our research on the integration of wind, geothermal and solar power into the market appears in leading academic journals, and shows that wholesale prices fall as more wind enters the mix. We are particularly proud of our innovative research into Auckland’s solar opportunities and have developed an online tool to estimate your home’s solar generation potential. Increasingly we will focus on energy-efficient transport, including public transport and electric vehicles.